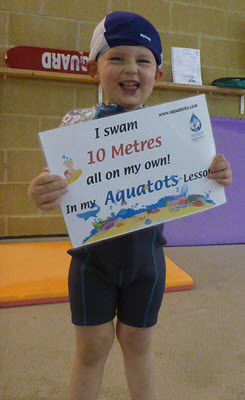 Aquatots are exceptionally proud of the achievements we see from our children during their swimming journey with us and we love sharing these stories with you. Much of that success really starts to show when our toddlers take everything they have learnt so far and achieve their first truly independent swim, not only swimming a whole 5 metres alone without the use of any buoyancy aids but also lifting their head up out of the water to take a breath during that swim which believe it or not takes a great amount of effort to begin with. In the table below you will see some of the record achievements that we have seen through the years. Once that 5 metres has been achieved confidently our children can progress into our Child programme which begins in Level 15. From here enhanced stroke work takes place and this is where we see real distances achieved as their swimming technique is perfected. We also love to truly celebrate these swims and therefore during each term in our child levels, we will hold a dedicated “Distance Day” where children are given the opportunity to swim anything from 7 metres up to 3 or 4000 metres being cheered on by their parents and classmates. The swimmers shown below are the youngest to have achieved the distances stated.